Petfinder Adoptable Pet #2: A Classy Virginia Cat | Will My Dog Hate Me? How is it possible to resist Cee Cee, so sultry, so silky, so silly: She will put her paws on your legs and look up at you until you pet her. Frankie does that to me and I find resistance is futile. It’s probably that little nose smudge, though, and the white tufts of hair coming out of her ears — why is that cute in cats but not in men, I wonder? — that inspired me to share a kitty profile here. And this is a classy site, so of course a tuxedo cat would fit right in. 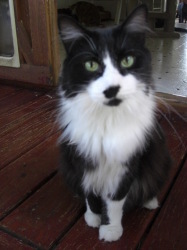 Click on Cee Cee’s picture to read her complete Petfinder profile. And please share this post on Facebook and Twitter, especially if you live near Prince George, Virginia, or know someone who does. This is one of our local babies; you bet I shared. Thanks so much for doing this!